The Wheel of the Year denotes Pagan Holidays. There are 8 major holidays, occuring on either equinoxes or solstices, and the 'between times'. The 4 Sabbats that happen on the 'between times' are usually referred to as the Greater Sabbats, and the 4 that occur on the equinoxes or solstices are usually reffered to as the Lesser Sabbats. Some traditions only celebrate the Greater Sabbats, some do the opposite, some celebrate all eight of them. Regardless of who does what, these are the way the northern hemisphere celebrates them, because I have heard from many in the southern hemisphere (especially Austrailian Pagans) they celebrate them in polar opposite of us. The dates on the image to the right are loosely accurate. What I mean by that: A good example is that some celebrate Samhain (pronounced SOW-in or SAV-ayn) on October 30th or November 1st, and some traditions even celebrate it on November 2nd, corresponding with All Souls Day. Most that do it this way want to avoid confusing it with Halloween, because many pagans still celebrate Halloween as the American holiday (Dressing their kids up, and taking them around for candy) so they want to keep it separate. 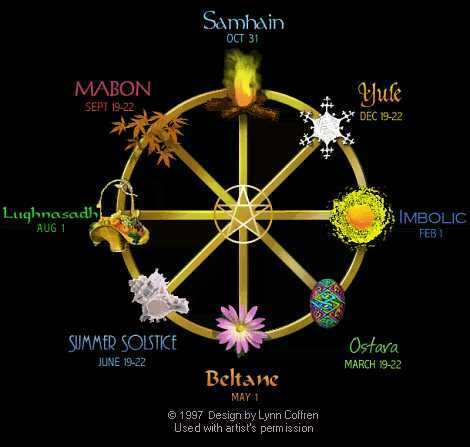 Keep in mind, not all traditions celebrate all 8 holidays, some only celebrate Samhain, Imbolg, Bealtainne, and Lughnasadh, excluding the solstices and equinoxes. Ritual Symbolism: This is the time when the God Passes on to be reborn of the Goddess at Yule. Tradition Notes: Pronounced "SOW-in, SAV-een". This is the time to honor the dying God, and also our loved ones who have passed on. It is customary to make a special place at the table, then put that plate of food outside for the dead to 'eat' as they pass through on their journey. Light Candles in the windows to light the dead's way home. It is said that if you taste food from the plate the following moring it will have no taste. Divination has importance at this time because it is said the veil between our world and the otherworld is very thin at this time. In ritual, it is customary to honor dead ancestors as well as the dying God. One point to ponder is also that it is rumored that Samhain was named after the 'Celtic God' Samhain, THERE IS NO GOD CALLED SAMHAIN, Celtic or otherwise. There I said it.. Ritual Symbolism: The God is born again to the Virgin Goddess, promising the sun's return. Deities: Holly King and Oak King, Newborn Gods, Virgin Goddesses, also triple Goddess, because this is a transitional time when she could be honored as all three, She is the Crone at Samhain, the Mother birthing the Child, and is the virgin again directly after the birth as she now sleeps traditionally til Imbolg. Tradition Notes: Pronounced "Yool". Decorating the tree, originally is a Pagan tradition, as the tree represents a phallus. Most pagans at this time also exchange gifts and feast. Ritually, it is a time of personal renewal, hope, and honoring life. Other Names: Oimelc, Imbolc, Imbolic, Candlemass, Lupercalia, Bridget or Bride's Day, Feast of Pan, Feast of Torches, Feast of the Waxing Light, Modern Irish: St. Bridget's Day. Symbolism: White Candles, brides, grain dollies, burrowing animals (Groundhog! ), ewes. Ritual Symbolism: Symbolizing the youthful God, and the awakening of the Virgin Goddess from her birthing the God at Yule. Tradition Notes: It is traditional to light many candles, or turn on all the lights in your house for a brief time to symbolize the return of the sun's light and warmth. You may also make dollies and put them in a cradle to symbolize the childlike Goddess at this time and you may evoke her and play child like games with her that she would enjoy. Ritual Symbolism: This Celebrates the full return of the Sun, and the Goddesses' Fertility, and the courtship of the two. Tradition Notes:Pronounciation: "Oss tara" Traditionally at this time you can evoke the God/dess and sing a courtship song to the other, and lay flowers on the altar. Also, encouragement to the sun to warm the earth, and provide for her. Ritual Symbolism: Celebrates the symbolic sexual union, consummation, or marriage, of the God and Goddess. Tradition Notes: Pronounciation: "BELL-tayn, BEEL-teen, Ball-TAWN" Come dance around the may pole! Celebrate life in all it's forms, fertility, and youthfulness! Call upon Puck to dance with you, have fun! Lay fresh flowers on the altar, let the Spirit move you. Associated Colors: Green, Bright 'booming' colors of summer! Symbolism: Bonfires, solar disks, sun-dials, feathers, blades. Ritual Symbolism: The Goddess is pregnant, and the God is at his powers' peak! Tradition Notes: Bonfires are lit, faery contact is possible at this time, it is a time for powerful magick, and honoring the Pregnant Goddess, and her powerful Consort. Associated Colors: Gray, gold, green, yellow. Symbolism: All grains, breads, threshing tools. Ritual Symbolism: This holiday marks the first harvest, and the God mysteriously weakens as the nights begin to get a little chillier, and the days a little shorter. Tradition Notes: Pronouciation: "Loo-NAHS-ah" (the d is silent) This holiday is named for the Irish sun God Lugh, and it is a grain harvest, traditional foods to include in the feast would be corn, bread, and grain products (I suppose if you wanted to you could substitute wine for grain alcohol in the cakes and ale if you can stomach that.. HAHAHA) Fruits and vegetables that ripen in late summer can be included, and be sure to offer some of these as a libation offering to the deities and faery folk, they'll love ya for it! Evoke or invoke Lugh. Ritual Symbolism: The God realizes he is aging, and he enjoys his older age and wisdom. The Goddess is still very pregnant, and they reminisce about the loss of their youth, but revel in the wisdom of old age. Tradition Notes: Pronounciation: "MAY-bone or MAH-bawn" The second harvest, harvest of vines, apples, and visiting burial cairns to place an apple on them. Feasting.